"Come on, join me for food...". That's what Mijune proposed one random night. Well, joining Mijune for food is quite common to tell you the truth. She can out eat me any day... 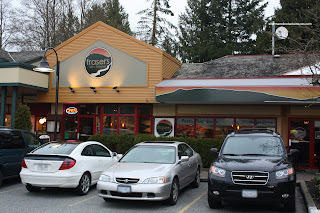 This random meal had something to do with a tweet from Jeremy eluding to meeting up for dinner at Fraser's Bistro in Surrey. Alright, I'm up for this. As I have said over and over again, there is very little love given to Surrey in terms of its culinary scene. Fair enough. 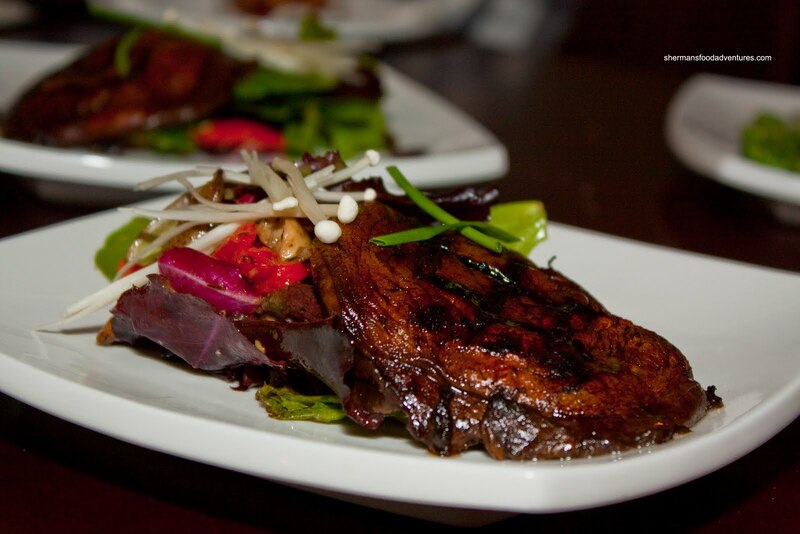 There are really not a whole lot of "fine dining" places in Surrey itself; but there are lots of places to eat. Fraser's Bistro isn't exactly fine dining; but it comes pretty close. Now, intention and reality are mutually exclusive, so we'll have to see if it can live up to it. Apparently, Jeremy used to work there and we were going to do a menu sampling of sorts; yet at the same time, pay for our own meal. Joining us were his brother and Mary from Mary in Vancity and her husband. We started with a shot of Gazpacho consisting of tomato, cucumber and red onion. I found this to be quite refreshing and appetizing. There was a decent balance between sweetness and acidity with a touch of spice. Only complaint would be the slightly gritty texture. Next up was Calamari with a red pepper aioli. On the bottom rested mesclun greens tossed in a buttermilk dressing. The fried squid itself was tender on the inside with a slight bite while pleasingly crisp on the outside. I would've preferred less salt in the batter thought. I loved the red pepper aioli, it was slightly spicy and went well with the squid. In fact, it want well with the buttermilk dressing as well. I guess they intended for the two to balance each other out. In actuality, it did accomplish that; but there was a tad too much dressing and made the greens limp. After that, we moved onto a pasta teaser (we had more pasta coming later). 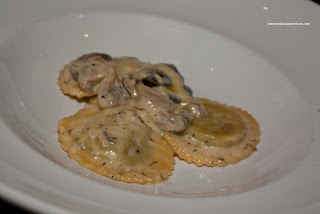 We tried the Ravioli stuffed with goat cheese, sundried tomato, caramelized onion. The pasta itself was made with butternut squash while laced with a sage brown butter and basil. This little bite was extremely buttery. Not in a bad way though. 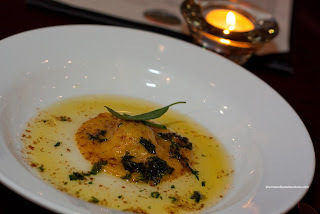 The sage brown butter was tasty and it did compliment the pasta itself. However, I felt that the sun dried tomato was overwhelming and masked the other components. Maybe a bit less would've maintained a better balance. 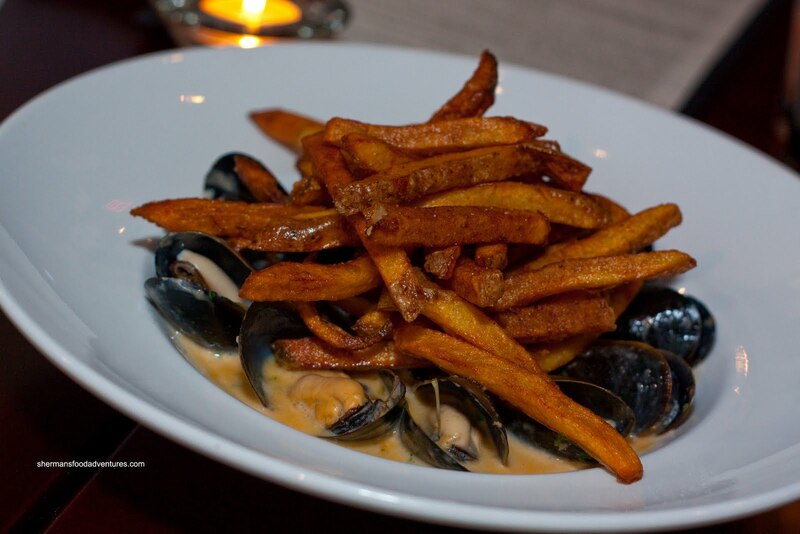 We were presented with 2 plates of Mussels next. The one pictured was the Thai Coconut Curry. I found the broth to be quite thick due to the copious amount of coconut milk. There was actually a nice kick from the red curry and it went well with the sweet, plump mussels. As a sauce, the broth would've went well with a bowl of rice; but in the end, it could've been a little less thick because it was too heavy for a seafood dish. As for the fresh cut fries on top, they were not as crispy as I would've liked. I'm pretty sure they didn't use Kennebec potatoes; hence they turned out to be on the softer side. For those who don't like it too crisp, they worked fine as a dipping device into the flavourful broth. Next, we moved onto 2 pizzas. 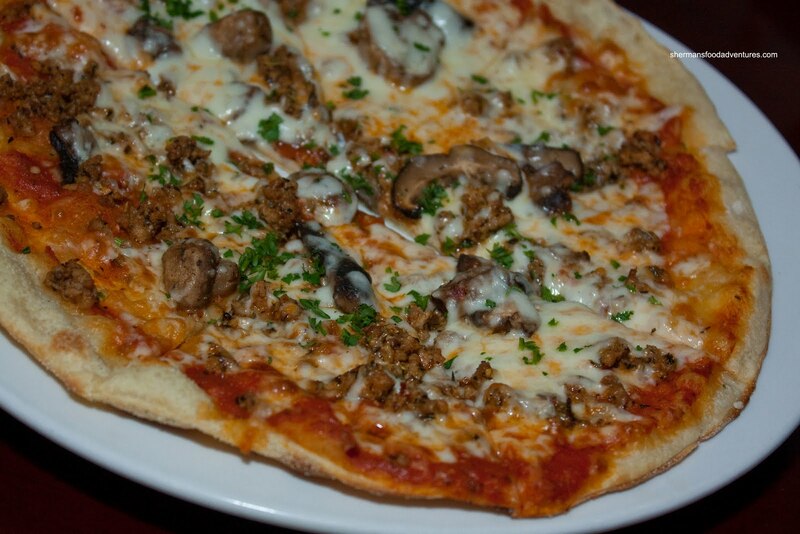 The Italian Sausage and Mushroom was actually quite good. I liked the zesty flavour from the combination of sausage and fresh tomato sauce. There was a modest mix of shiitake and button mushrooms which did add the usual earthiness to the already flavourful pizza (that is only if there were mushrooms on the slice). While not a Neapolitan pizza, the thin, crisp crust was good in its own ways. Our second pizza was the Tomato, Boccocini, Basil and Red Peppers. I thought this pizza was a little heavy on the cheese and short on taste. Hence the crust was not as crisp as the other pizza. 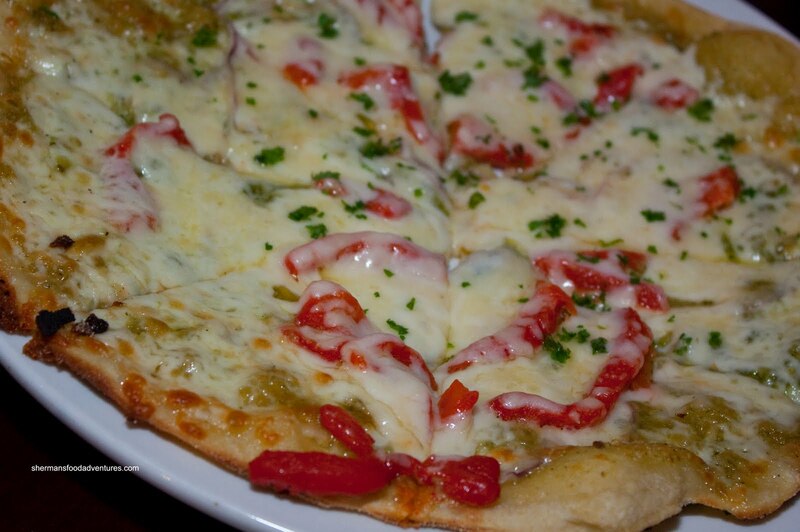 I did like the red peppers, they were sweet; but then again, the basil-pesto-like sauce did not provide any impact. I call it a "pesto-like" sauce because it sure looked like pesto, albeit a pale one. However, it wasn't particularly pesto-like in flavour. The menu says it is basil; yet if this was the case, then it would've been much more effective if they added fresh basil on top of the pizza. Continuing our tour of carbohydrates, we were presented with 3 different pastas starting with the Smoked Salmon Fettuccine with capers and goat cheese. I found the sauce to be very creamy while not being too heavy at the same time. 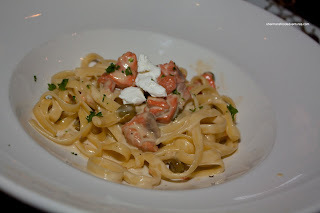 There was the right amount of smoked salmon where it did not overwhelm the rest of the pasta. The pasta itself was cooked properly being al dente. The item that made the most impact was the capers. There was only a modest amount of them; but they added a nice zip that helped balance the richness. 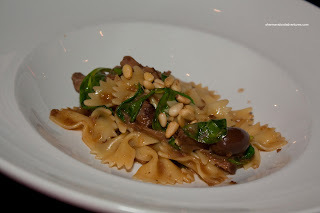 The next pasta was the Lamb Farfalle which consisted of shredded lamb, spinach, pine nuts and lamb jus. Once again the pasta was done right. There wasn't much lamb jus; yet there was still adequate flavouring which was not gamy. The lamb itself was a tad chewy while the spinach was wilted just enough. It retained a vibrant colour and did not even get close to being mushy. The roasted pine nuts were naturally a nice addition in terms of texture and well, nuttiness. Our last and probably the best of the 3 pasta was the Mushroom Ravioli. Stuffed with mushroom laced in a thyme cream sauce and more mushrooms, this was a rich offering. Curiously, it wasn't as earthy as one might expect with so much mushroom. No matter, it was still good being more subtle than in-your-face. 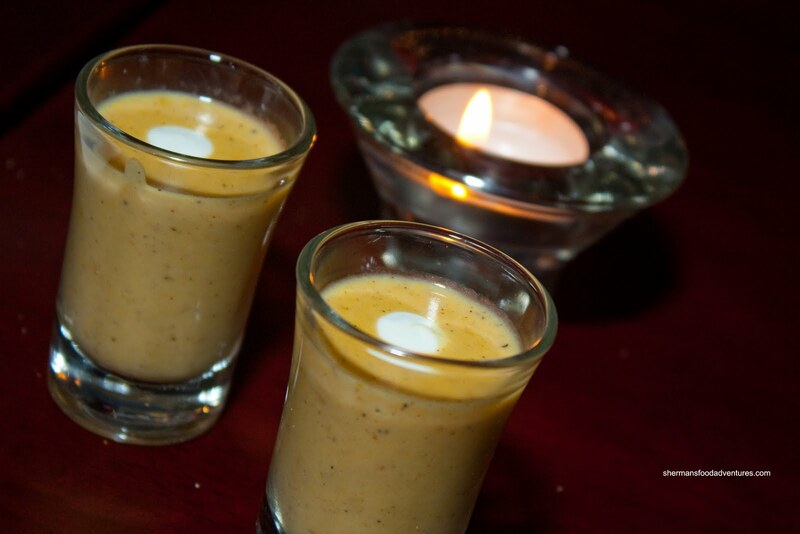 After the fairly heavy pastas, we were presented with an interlude of sorts - a shot of Roasted Corn Chowder. Despite being a small portion of a larger soup, this had to be hands down the highlight of the night. This soup had it all. It was savoury, sweet, creamy, smoky and spicy. This had a certain Indian flair to it as there was a pronounced curry hit to it. I could have had many bowls of this. With my taste buds still singing, 2 salads arrived. 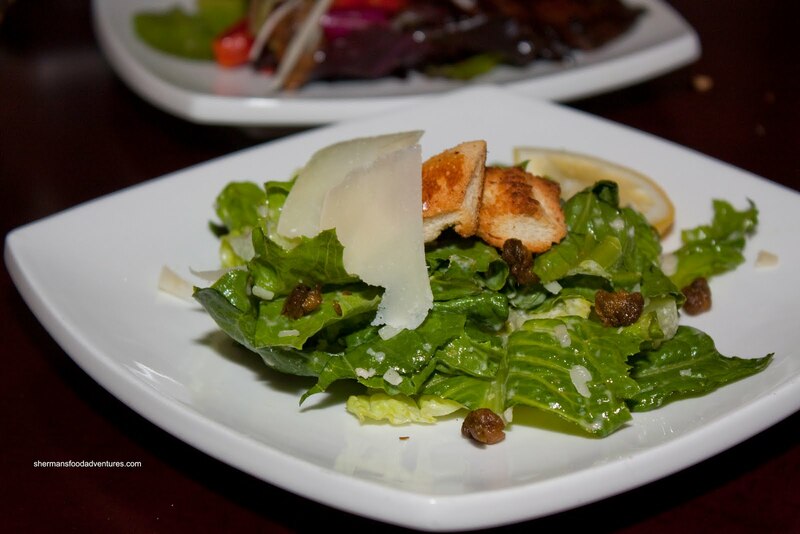 Now, whenever one orders a Caesar Salad, it almost seems a bit boring. Well, especially at chain restaurants, it does become quite generic. So I wasn't exactly expecting much. I was pleasantly surprised to find that the dressing was made in-house. It was well-balanced in terms of saltiness and acidity. The freshly shaved Parmesan added a nice nuttiness. But the one thing that really set this salad apart was the fried capers. 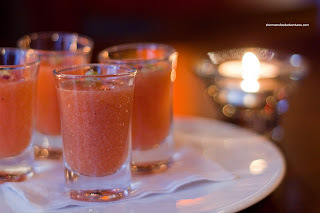 Texturally and flavourwise, it made the Caesar something better than the usual. While the Caesar was good, the Grilled Portobello Mushroom was not. I normally love grilled portobellos, they are so "meaty" and mushroomy (is that a word?). But for some inexplicable reason, the portobello was marinaded in far too much vinegar. Not only did it destroy the natural flavour of the mushroom, the texture became very unappetizing as well. That was really too bad since there were nice grill marks which could've tasted great if it weren't for the over-acidic marinade. After our salads, we proceeded to the meat dishes. As they arrived all at once, there wasn't really an order to it all. 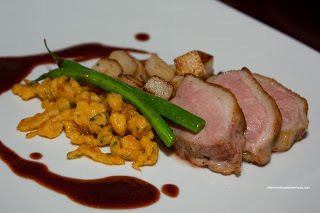 So I quickly snapped photos of everything and started with the House Smoked Duck Breast with spätzle. The duck wasn't exactly tough per se; but I thought it was sliced too thick which made it appear to be chewy. In fact, I found the texture to okay and the meat itself exhibited plenty of smoke flavour. One thing I did find chewy was the skin. It was not rendered enough or prepared in a way that was easy to eat. Rather, it was akin to gnawing on undercooked bacon. Not pleasant in texture nor taste. The spätzle was dry and lacking flavour. I did not enjoy it. I wasn't exactly sure about the composition of the accompanying sauce since it was predominantly sweet. It may have been some fo rm of berry reduction? 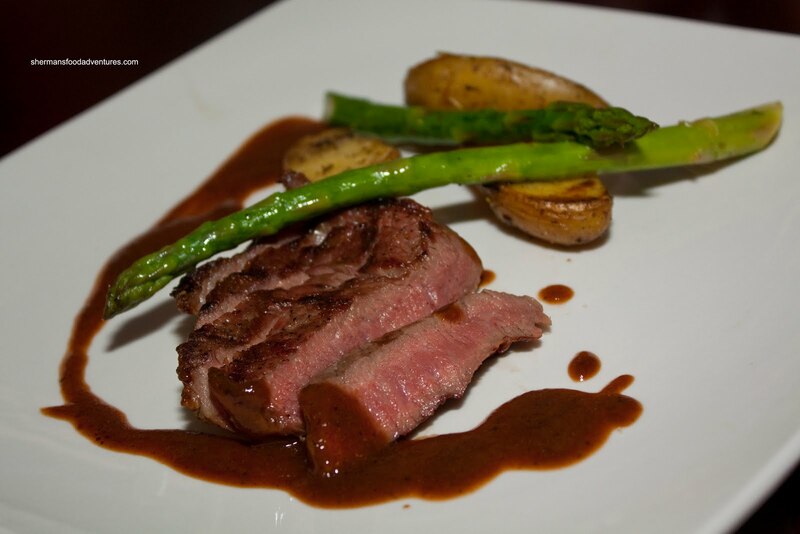 On the topic of sauces, I didn't know what to think about the demi-glace that decorated the plate with the Certified Angus Grilled NY Strip. The steak itself was tender and cooked nicely medium rare. No issues with the quality of the meat nor its execution. However, the demi-glace tasted like water-down HP Sauce. I guess the tang resulted from the red wine while I was not sure where the graininess originated from. It was far from silky and far from being balanced. That really detracted from the nice steak. On the other hand, the asparagus and fingerling potatoes turned out quite well. Our last protein was the Seared Halibut. 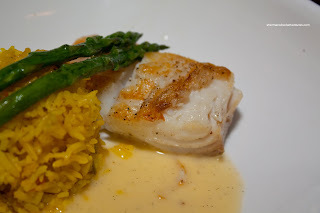 The fish itself was prepared properly being flaky and moist. However, it was severely under-seasoned. Even the sauce couldn't bring the fish to life. About that sauce... I'm not sure what it was. It was slightly sweet and not much else. It didn't have enough acidity or salt to properly flavour the fish. The side of rice was also bland and a bit dry too. It's really too bad since all the proteins were cooked quite well whereas the sauces were weak. If they can work that out, the dishes would be more successful. Finally after all these dishes, we ended up with a dessert sampler which consisted of 3 items. The first one I tried was the Bailey's Creme Brulee. At first glance, the torched sugar topping had a pleasing caramel colour and was the right thickness. Once inside, I found the custard to be quite smooth and predominantly sweet. I could detect the Bailey's while the real vanilla was not evident until I got to the bottom of the ramekin. Not a bad attempt. 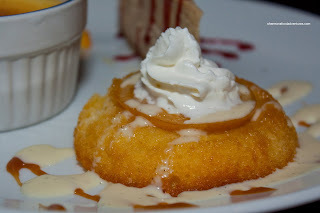 Next dessert was the Lemon Upside Down Cake. For me, I'm a sucker for anything lemon wh en it comes to dessert since I really enjoy the tartness. However, there was none of that evident in this cake. It was moist though and served warm. So on that level, it was a good cake. 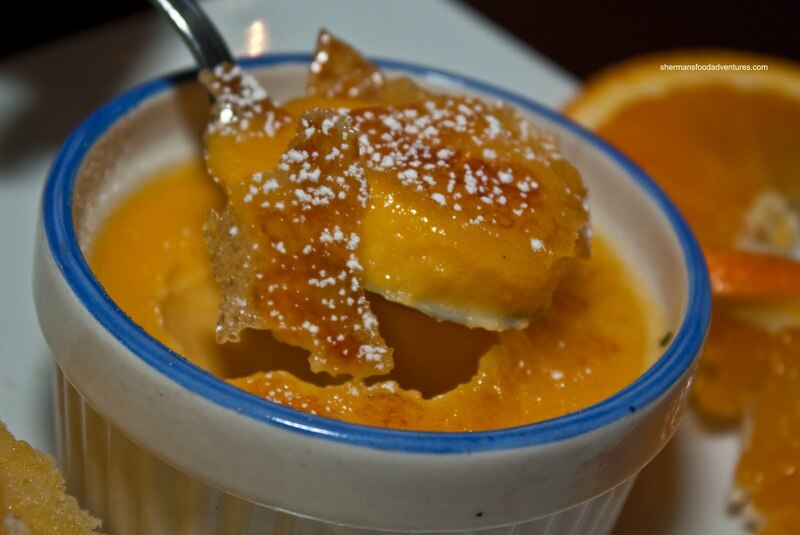 Yet, for me, a lemon dessert is not a lemon dessert without the tartness. The last dessert was what we categorize as an "epic fail". 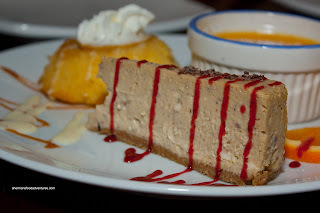 When I first took a bite of the Cheesecake, something immediately dawned on me. I couldn't find the words; but I knew something was absolutely wrong. I deferred to Mijune who declared it as "curdled". Ah yes, thank you, that was the right term. You see, there were bits of cream cheese stre wn throughout the cheesecake. So very, very wrong. Honestly, I didn't even know what kind of cheesecake it was. It was brownish in colour; but did not taste like coffee. Neither did it taste like any discernible fruit. I really didn't know what flavour they were trying to go with this and add in the incorrect texture, this was a really bad cheesecake. I'm sorry to be so blunt; but there is not other way of putting it. In fact, this illustrates my argument that a restaurant is only capable of what it is capable of. Despite the announced presence of Mijune and myself, the food was what it was. 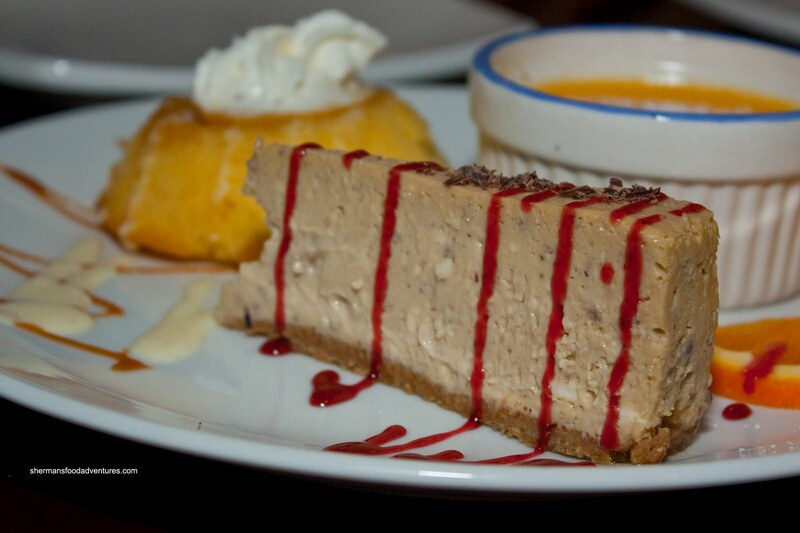 The sauces for the entrees need some work, as wi th the desserts (especially the cheesecake). Now, to be fair, we tried almost everything off the menu and there were indeed some high points. The pizza was not bad considering this is not a pizza joint. Furthermore, the pastas are more than acceptable. 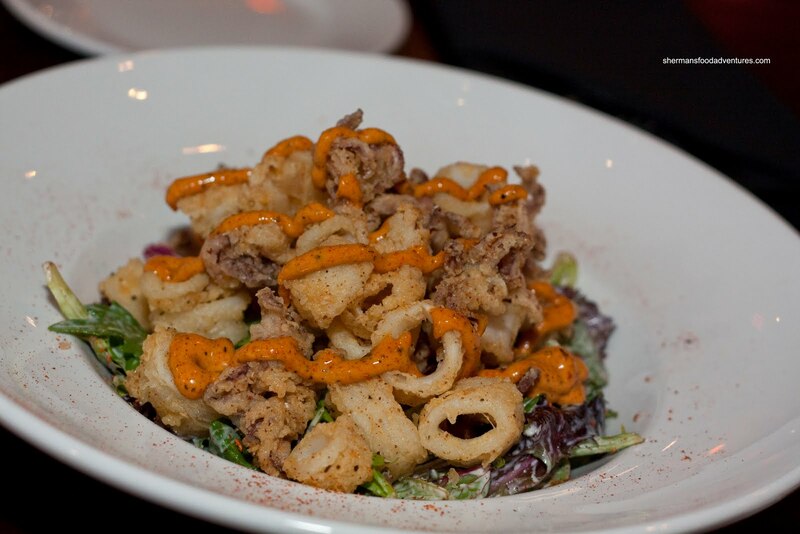 It also must be noted that the more casual dishes, such as the calamari were very good. Despite some execution issues, I must give Frasers Bistro kudos for attempting this type of food, particularly given its location. - Not a bad per se; but their location doesn't scream out "fine dining"
The food looks pretty good. One question though, all the portions look tiny. So was this a tasting portion, and can you actually order it like that, or was this special request? Hey Jenny, yah the portions might be skewed due to the tasting. However, you have to make your choices carefully though. Some dishes are definitely better than others.